﻿ OMG Hotel Khonkean, Khon Kaen | FROM $17 - SAVE ON AGODA! 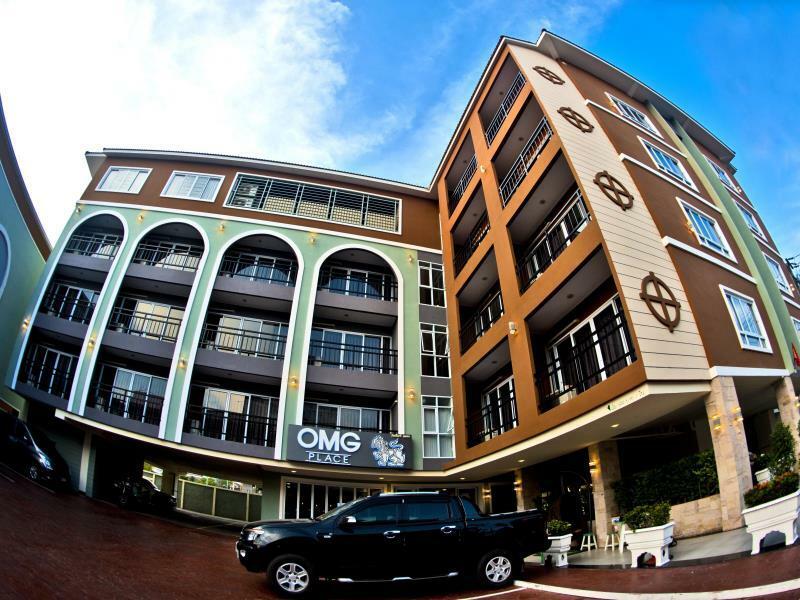 Have a question for OMG Hotel Khonkean? "We were pleasantly surprised by the rooms, which were clean and well appointed." "A nice hotel near the center of Khon Kaen." "It is clean and gives you good value for the money." 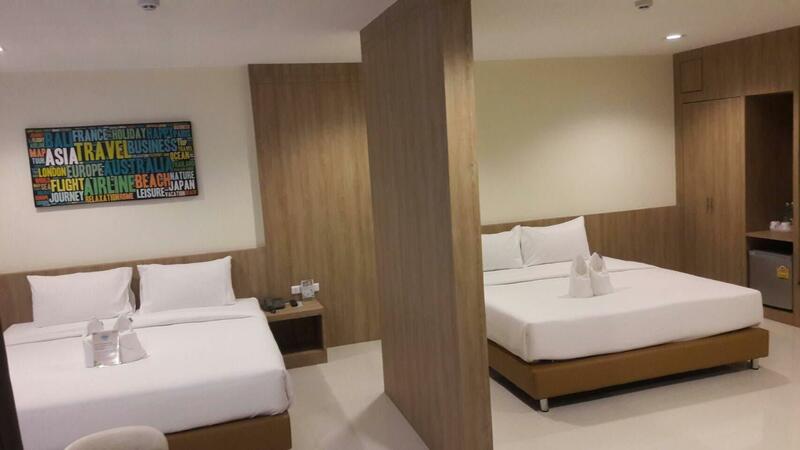 "Quite new and Clean hotel, near center of Khonkaen city." 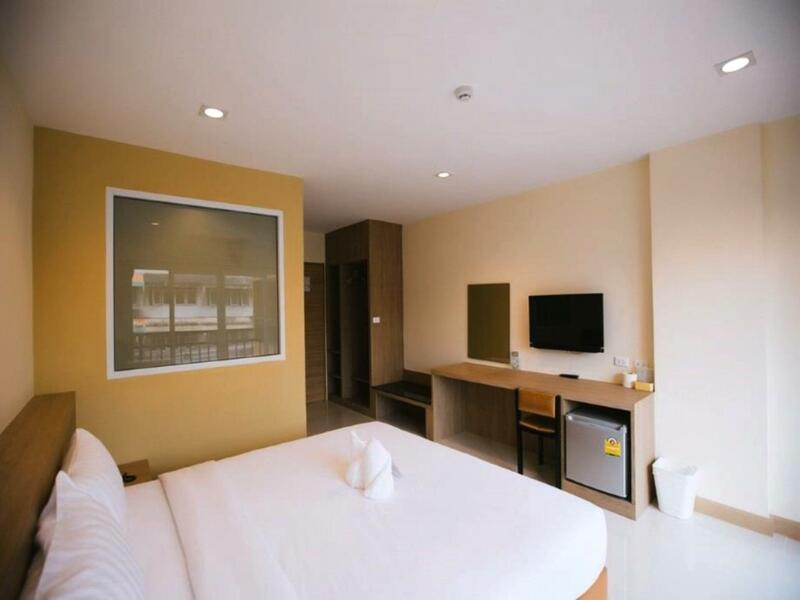 Designed for both business and leisure travel, OMG Hotel is ideally situated in Khon Kaen Shopping Center; one of the city's most popular locales. Only 6 km away, this 3-star hotel can be easily accessed from the airport. With its convenient location, the hotel offers easy access to the city's must-see destinations. Take advantage of a wealth of unrivaled services and amenities at this Khon Kaen hotel. The hotel provides free Wi-Fi in all rooms, 24-hour security, shrine, convenience store, daily housekeeping to ensure our guests the greatest comfort. 43 rooms spread over 5 floors provide a warm and pleasant home away from home. Modern comforts such as television LCD/plasma screen, additional bathroom, additional toilet, complimentary instant coffee, dressing room can be found in selected rooms. Besides, the hotel's host of recreational offerings ensures you have plenty to do during your stay. Whatever your reason for visiting Khon Kaen, the OMG Hotel is the perfect venue for an exhilarating and exciting break away. "Very clean and modern looking with great staff and a bright..."
Clean, quiet, good wifi and the front desk really stands out for helpfulness and efficiency. There isn't much to see in the immediate neighborhood, but there is a lovely coffee shop in the mall around the corner, and a good night market in the weekends. We were pleasantly surprised by the rooms, which were clean and well appointed. The beds are very comfortable, with a working TV and complimentary snacks/water. The bathroom is very spacious and toiletries were topped up daily. In terms of location, it served my purposes very well as it is walking distance away from great food stalls and only a 15 min walk away from Central Plaza. If your looking for a gym and swimming pool then forget it. If however your looking for a comfortable and clean bed to sleep in and a nice fresh shower then this is the place. It’s a great medium sized hotel in the centre of town. Very clean and modern looking with great staff and a bright atmosphere. I would not hesitate to stay there again. My daily cleaning lady was excellent. Thank you very much. I had noisy neighbours at 3am. One call to reception and problem fixed. I can only praise OMG after my second successful stay with them. Thanks OMG. New, clean good service even the mini bar was low price. They don't do breakfast and the restaurant is a small place doing limited Thai meals from 9 until 5 only. The only complaints are no hairdryer, the design puts the light switch as far away from the bed as you can get but these are not really complaints. The mattress is slightly hard as Thai people like it. I would return for sure. The property is very new. It also has a lot of animals and cartoon figures around, so kids might like it. The location pretty good, 2 minutes from a good cafe in a strip mall, and a ten minutes walk to the Hugz Mall. It's also about 10 minutes from a weekend walking street. No pharmacy or 7/11 nearby, however, or restaurants I would care to go to. The staff is English-speaking (to a degree) and very good; they do laundry, call cabs, handle left luggage with alacrity. When I stayed here previously, I was on the third floor, street-side; that was quiet. This time, I was on the third floor in the back, and was awakened (I sleep late) by a loudspeaker from the Mall and the national anthem. I'm a solo traveler, I need a solid WiFi connection, security, and quiet. OMG Hotel Khonkaen has all that and other nice features as well. The front desk is excellent: I came in early on the night train from Bangkok, and they got a room prepared for me before official check-in. They also do laundry and call taxis. The room is large, with new and clean walk-in shower, fridge, big beds. Water and snack cakes every day. Air con is fine. I was on the street side, but I still slept well -- I was 3 floors up, though; I don't know what it's like on the ground floor. There are also cute cartoon statues in the lobby for the kids. There's lots of parking. The only reasons not to mark the facilities excellent is that you can't turn the room lights off from bed, and the taps in the shower and sink were a bit fiddly. The location is perfectly safe, but there's little of interest near it. There's a lovely open-air coffee shop with WiFi round the corner at Ozone Village mall. In fact we loved it so much we made a point of stopping here again on our return journey. Wonderful staff with good English and happy to practice with you, great room with a comfortable bed and all you could want, some undercover parking, some open, close to some good local Thai restaurants but also only a short drive to Central Plaza. Happy to recommend OMG and we'll certainly be back next time we're in Khonkaen. This was our second stay here, the hotel impressed us so much we stopped again on our way home from Savannakhet. Very friendly, helpful and welcoming staff, very comfortable and clean rooms, and close to many local restaurants or a short drive to Central Plaza. Confidently highly recommend OMG. Incredibly clean and comfortable room, with a sparkling bathroom and excellent hot water shower. Location is convenient for the central bus station (which is connected to the long distance bus station by a regular shuttle) and Gai Yang Rabeab (famous grilled chicken restaurant). Centralplaza, the train station, the lake and the night market are all accessible using local transit (songthaew or the new city bus). Staff were all very friendly and helpful. If I find myself in Khon Kaen again, I would be happy to stay at OMG again. From the airport, the taxi drivers know OMG Hotel (it costs 50 THB above the meter reading). The hotel is spacious, clean, and ours came with a balcony to boot (though not much of a view). For its price, we would definitely come back again. If you are visiting Khon Kaen as a tourist for a couple of days, there are basically three good areas: Thanon Glang Mueang in and around Roma Hotel; Thanon Pracha Samran near Glacier Hotel and Soi Ruenrom 1 near Kosa Hotel and Pullman. If you stay anywhere else, you’ll need transport just about every time you step out of the hotel entrance. OMG is okay and clean enough. The staff are also very nice but the area is dead after 8pm. There are packs of dogs roaming the streets after dark too so it’s a hassle walking anywhere, especially towards Central Plaza. We stayed two nights then switched to another hotel. A nice hotel near the center of Khon Kaen. It is clean and gives you good value for the money. The hotel does not have breakfast but 200 meters there is another hotel that offers breakfast for 150 Bath. I also missed bedlamp, otherwise everything was very good. We stayed here for five nights. Very clean and modern facilities (elevator, hot water, decor). The only catch I found was the beds were too uncomfortable for my liking. Sufficient parking with very hard-working parking staff. There are a few places to eat nearby (congee, chicken and rice, steak and salad place). New hotel in Khon Kaen center represents clean, valued room with good service. The room is clean and good, staffs were nice. I'm very pleasure.